A decade ago a permanent monument dedicated to Port Hope resident and author - the late Farley Mowat - was built on private land. Commonly known as the boat roofed house, this structure is considered to be the largest monument in the world dedicated to this renowned author. It will be dismantled and reassembled at its new location in Eastside Ganaraska Park during Thanksgiving weekend. 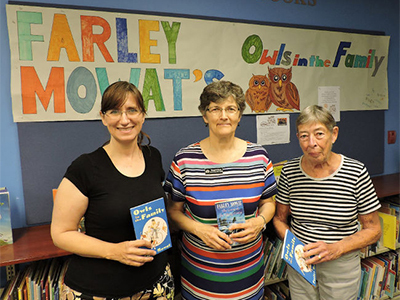 Bree Nixon, Margaret Scott and Lou Pamenter are pictured at the Port Hope Public Library. Moving a stone building (or in this case a stone boat) stone by stone, is not something to be taken on lightly. The chances of having all the stones fit back together properly are slim. Once a couple stones get put in the wrong place, or worse, go missing, the whole integrity of the original structure is compromised. In 2005 Ryan Young sat down with author Farley Mowat to interview him about his life and the things that mattered most to him after 84 years. This is an excerpt of that interview. Book Sales provided by Furby House Books 10 - 4:30 - books will include signed out of print, currently in print, and guest author books. Ken McGoogan - The award-winning author of a dozen books. Ken's recent books include How the Scots Invented Canada and 50 Canadians Who Changed the World. He has also published four nonfiction narratives about Arctic exploration, among them Fatal Passage and Lady Franklin's Revenge. Anna Porter author of four non-fiction books, and a memoir, The Storyteller: A Memoir of Secrets, Magic and Lies. She has also is one of Canada's most respected book publishers for 30 years. She was co-founder of Key Porter Books. Publishing such authors as: Farley Mowat, Allan Fotheringham, Margaret Atwood, Jean Chretien, Conrad Black, and many others. She sold her interest in the company in 2004 to H.B. Fenn Limited. Book Sales provided by Furby House Books 11 - 3 - books will included signed out of print, currently in print, and guest author books. DSWAC ran a special summer workshop in support of the upcoming Farley Mowat Boat-Roofed house relocation, Thanksgiving Weekend (October 8 - 10) here in Port Hope. After ten years on private property, this singular tribute to one of Canada's greatest writers and environmentalists is being relocated to the town park along the Ganaraska River, fittingly right across from the public library. 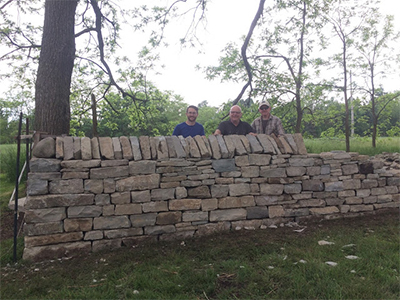 Seminar participants collaborated in the construction of a 4 foot high dry stack wall running along the perimeter of a shaded historic residential property bordering a picturesque farm field. Walling basics such as foundations, batter, through stones, hearting, coping and various design issues were dealt with during this totally hands-on course. There was no heavy lifting or machinery used. It was a sunny happy event. Lunches and drinks were provided and written material backed up the instruction. End of second day of the "Following Farley" Fundraiser Dry Stone Workshop Event in Port Hope, On. After ten years on private property, the Farley Mowat Boat-Roofed House, a tribute to one of Canada's greatest writes and environmentalists is being relocated to the town park along the Ganaraska River in October on Thanksgiving. 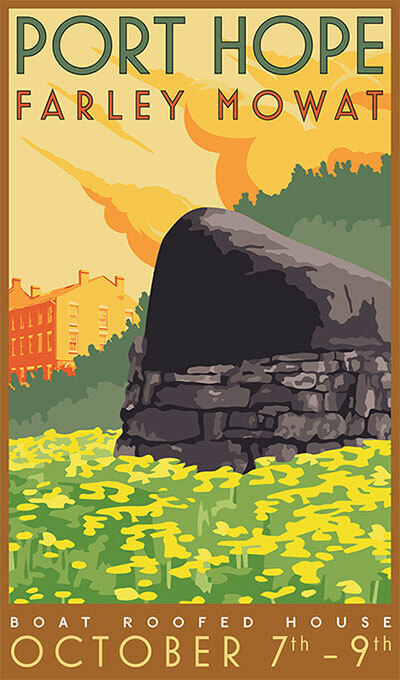 DSWAC will be running a special dry stone wall workshop in support of this stone structure relocation June 4th and 5th in Port Hope. 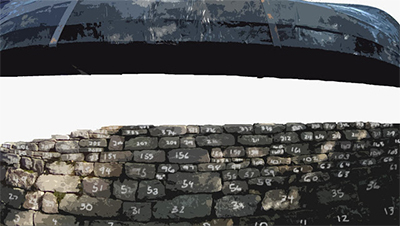 Walling basics such as foundations, batter, through stones, hearing, coping and various design issues will be dealt with during this hand-on workshop. There will be no heavy lifting or machinery used. The seminar will run rain or shine. Lunches and drinks will be provided as well as written instructions. Much of the money raised will be donated to the Thanksgiving celebration. Cost is $250 for the June 4th and 5th 2016 weekend event. For more details, please contact mcclaryharris@sympatico.ca or by phone at 905-885-4298.